Sometimes official apps slip under the radar, especially if it’s only an update. 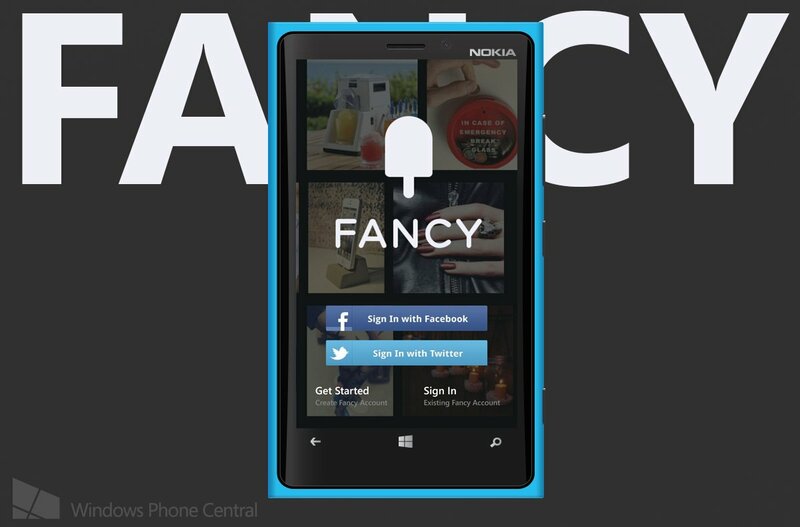 Photo sharing website The Fancy updated their app to support Windows Phone 8 a handful of weeks back. It’s a fairly awesome app if you’re one of the 3 million active members on Fancy. Let’s check it out. First off, a lot of you (me included) are probably wondering what exactly is Fancy. It’s billed as “part store, blog, magazine and wish list” and that’s exactly what it is. Take those cool blogs that show off gear you always want (but may not need) and integrate the ability to buy them and you have Fancy. Like the lovechild of a one-night stand between Pinterest and Tumblr. Here’s the app. If you’re signing up for Fancy for the first time through the app you can find friends to follow through Twitter or Facebook, otherwise the app will help suggest feeds to follow based off your interests. Once you’ve done that you’ll be seeing your ‘Home’. Swiping to the right of Home and you’ll see: browse, lists, collection, notifications, gifts, and menu/settings. Home is where you’ll see items posted by people you follow. You can ‘fancy it’ (like/favorite/save it), add it to your own lists, or leave a comment. Some items you can even see the price in the upper right corner and buy it right then and there. It’s the ability to buy items you find while browsing immediately that helps set Fancy apart from other ‘gear’ blogs. 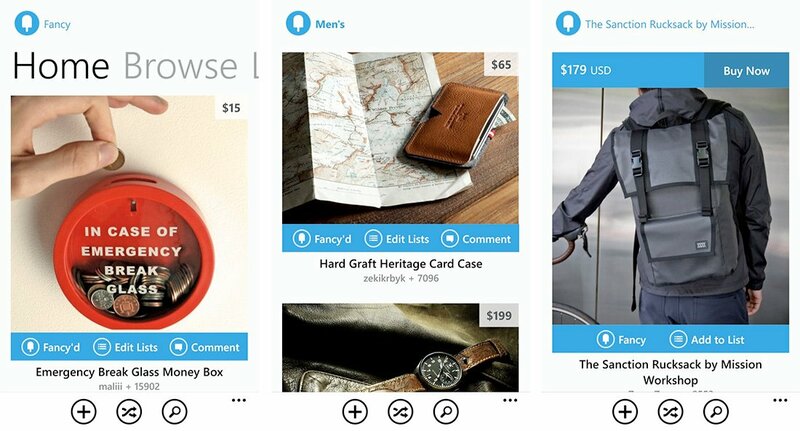 The Browse section of the app is where you can find other popular items by category. It’s great if you aren’t following a bunch of people and want to just check out other items. For example, the men’s category will have things like clothes and accessories targeted at a male audience. I could see this app being handy if you’re gift shopping for someone in your life. Take your girlfriend for example, you might hit up the women’s category to get ideas for her upcoming birthday. It’s nice because you can quickly browse a large variety of clothes, jewelry, and accessories fast. It’s a fairly cool app and service, I’ll be exploring it more over the next few days. Playing around with the app on my Lumia 920 and I noticed some features you’ll only get with Windows Phone 8. Double wide tile, lockscreen support, and fast app resume are all present. Has anyone else used Fancy in the past? How does the new app compare? Sound off below! 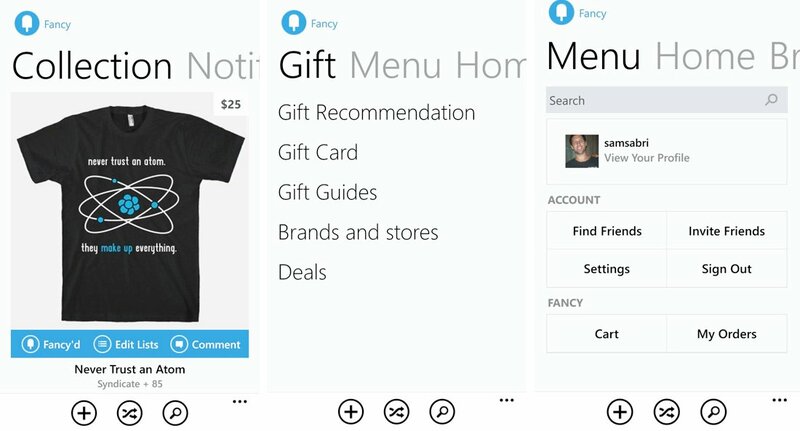 Fancy is available for both Windows Phone 7.x and 8 and is free. You can grab it here in the Store, use the QR code below, or swipe to the right in our Windows Phone Central app.